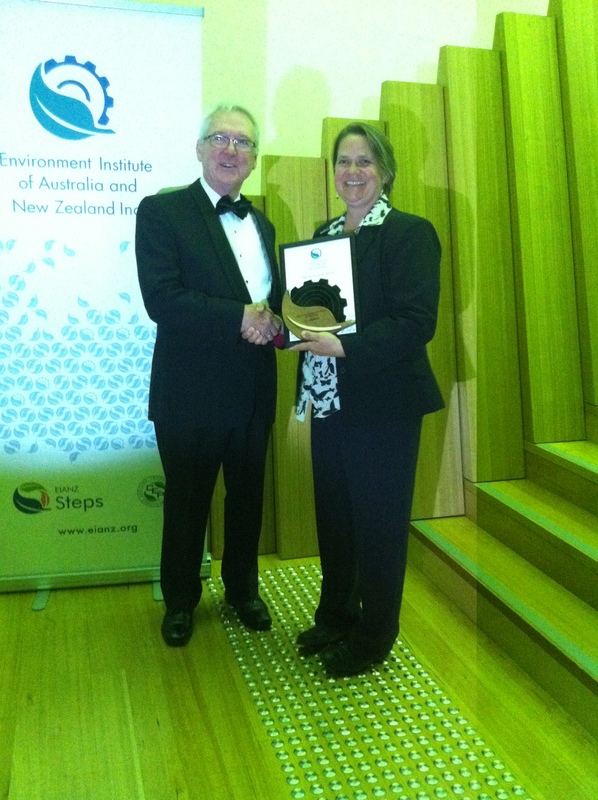 Hobart, 30 October 2014 – The title of Environmental Practitioner of the Year 2014 has today been awarded to Su Wild-River, Director of the Canberra-based consultancy Wild-River & Associates, at the Annual Conference of the Environment Institute of Australia and New Zealand. The award was granted to Dr. Wild-River by the Certified Environmental Practitioner (CEnvP) Scheme during a gala dinner at the Hotel Grand Chancellor in Hobart, Tasmania. Dr. Wild-River has won many other awards for her work on promoting sustainability, including with the Australian National University Sustainability Program, which she has co-led for 14 years. She also makes science accessible to the public through her blogs that translate technical writing into plain English and is a Visiting Fellow at the Australian National Centre for the Public Awareness of Science. The title of Environmental Practitioner of the Year is awarded annually by the CEnvP Board, to an environmental professional who has demonstrated excellence in their field and made an outstanding contribution to the environmental profession. Dr. Wild-River received the award during the Annual Conference of the Environment Institute of Australia and New Zealand (EIANZ). This year’s conference ‘Living on the Edge’ explores 21st century solutions to environmental challenges, providing an opportunity for academic and professional exchange between environmental practitioners and featuring a range of professional perspectives from environmental management and policy to tourism and communications. The EIANZ is a not-for-profit professional association for environmental practitioners from across Australia and New Zealand. Formed in 1987, the EIANZ certifies the proficiency of environmental practitioners, promotes independent and interdisciplinary discourse on good practice environmental management, and is an advocate for ethical professional practice and sustainable environmental outcomes. This year also marks the 10 year anniversary of the CEnvP, established by EIANZ in 2004. Congratulations Dr WildRiver. We deserved I’m sure. You’re such a great advocate at every level and we are all proud to be your associate! Thank you Peter. I am very proud to be your associate as well. It’s very pleasing and encouraging to get the award. I feel inspired and energised to continue on the sustainability leadership pathway. Cheerio.